Mention in "Pioneers In Peaceful Rest" A modern monument. Wife of Henry Hardy and William Sanderson, mother of Albert and Upton "Harry" Hardy and 15 other children; born November 20, 1829; died August 30, 1907; buried September 1, 1907. 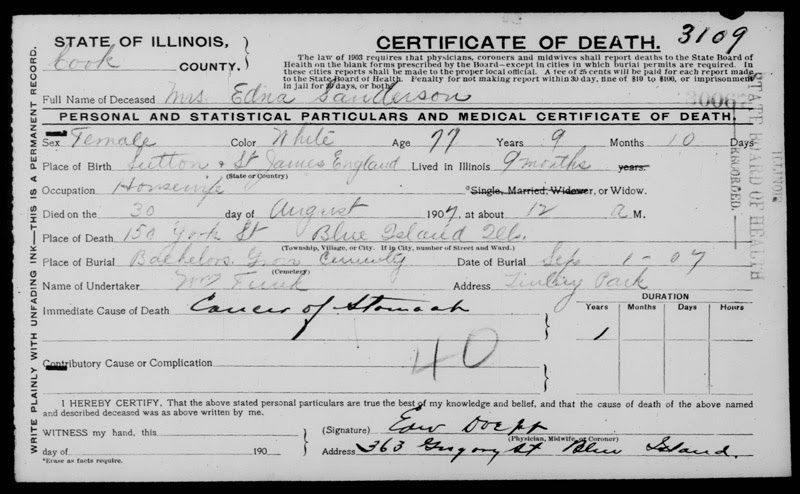 Born May 25, 1870; died March 3, 1914; buried March 6, 1914. She was removed to First Evangelical Cemetery on 127th Street in Alsip about 1955 and reinterred next to her husband, Upton "Harry" Hardy and his brother Albert Hardy. Many friends and relatives were shocked to hear of the sudden illness and death of Mrs. Harry Hardy, who died Tuesday morning after an illness of three days. Mrs. Hardy was suddenly taken ill with mengetis (sic) Sunday morning. Dr. Snider was called and she was removed to the St. Francis hospital, Blue Island, Monday morning, where she passed away the following morning. Mrs. Hardy was a loving wife and mother and was loved by all who knew her. Rev. Mr. Maplesden of Harvey preached a sermon that will be remembered by all who heard it. Helen Josephine Carlson was born at Geneseo, Ill., May 26, 1870, and was united in marriage to Harry Hardy, March 2, 1907, to which union were born one daughter and two sons - Alice Josephine, aged 5 years; Henry Upton, 3 years, and Frederick William, 1 year 8 months. She leaves to mourn her loss, her husband and children, three sisters and three brothers, all being present at the funeral but one brother residing in Bison, Okla. She was laid to rest in the Bachelor Grove cemetery Friday at 2 o'clock. The following was submitted by Brandi Dudlicek. Information submitted by Brandi Dudlicek.